Use of different coating technologies to apply a functional film-coating polymer onto drug layered pellets. One has to consider various aspects when deciding on a coating technology. Process efficiency, content uniformity of the applied coat, and economical aspects are features of utmost importance, yet vary depending on the type of coating employed. Especially within the realm of functional coating and/or drug layering, this question is of serious importance. The aim of this study was to compare three different coating technologies efficiency in a pellet coating process. Pellets (20 – 25 mesh, IPS) consisting of sucrose and microcrystalline cellulose were used as substrate. As tracer, Riboflavin (BASF) embedded in a film of poly(vinyl alcohol)-poly(ethylene glycol) graft copolymer (Kollicoat® IR, BASF), ratio 1:2, was applied as aqueous formulation with a solid matter content of 15%. The functional coat was based on poly(methyl methacrylate-co-(2-diethylaminoethyl) methacrylate) copolymer (Kollicoat® Smartseal 30 D, BASF). Further components of the formulation (Table 1) were: FD&C Blue No. 1 (BASF), acetyl tributyl citrate (ATBC, Jungbunzlauer), buthylene hydroxy toluene (BHT, Lanxess), docusate sodium (DS, Cytec), and talc (Merck). 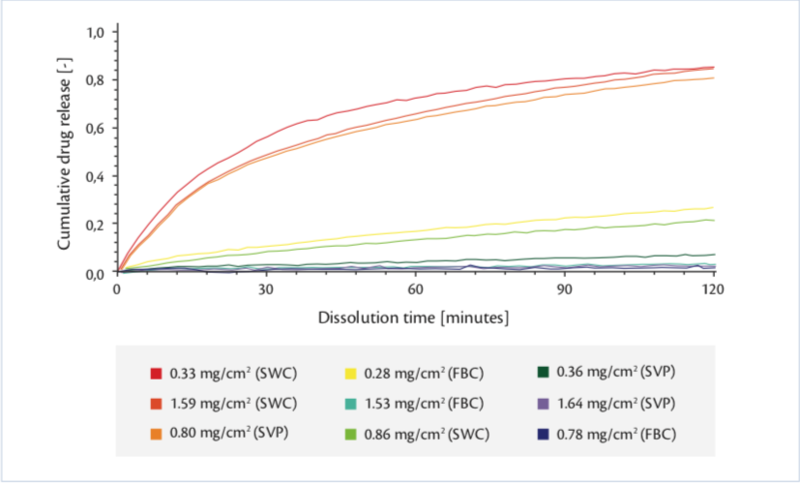 The solid matter content of the formulated Kollicoat® Smartseal dispersion was 20%. 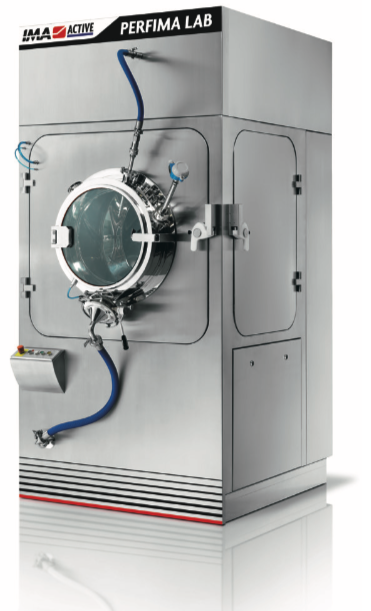 Three different coating technologies were used in this study: a fluid bed coater (FBC) Mylab, with bottom spray configuration, a solid wall drum coater (SWC) GS HP 25, and a side vented pan coater (SVP) Perfima Lab, with wedge wire screen drum. The latter drum has been specifically designed for coating of small substrates such as pellets. Small wedge wires are fitted into the drum wall to allow the passage of process air. The drum maintained the same drum shape, mixing baffles and spray system as the standard equipment for tablet coating. All machines were provided by IMA Active division (Bologna). The coating trials were performed according to schema listed in Table 2. To allow a distinct investigation on the coating level, the individual amount of applied coat was determined by photometrical measuring of either Riboflavin or the colorant FD&C Blue No 1. For dissolution testing, a standard USP Dissolution Apparatus 2 (Paddle) from ERWEKA, equipped with continuous on-line UV measuring (Agilent 8453), was used. Since taste-masking functionality is to be delivered in the oral cavity, phosphate buffer (pH 6.8) was used as dissolution media (700 ml±1%, 37°C±0.5 K, n=13). Firstly, Riboflavin was coated onto the pellets as a tracer for the later performance testing of the functional coat (dissolution). In all three coaters, the same coating formulation with the same solid matter content was sprayed onto the pellets for five hours, using optimised settings for each individual technology. 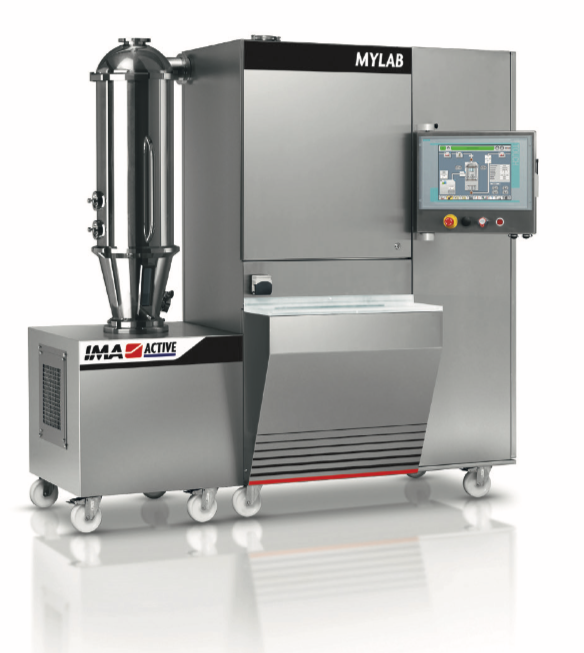 The achieved weight gain revealed an excellent performance of the fluid bed coater. However, employing standard deviation as a scale for content uniformity, the solid wall coater presented best results (Table 3). of 3.5 mg/cm2 onto tablets to gain functionality. When applying the same coating formulation, onto pellets, full functionality could be achieved with distinctively lower coating levels in all coaters. The reason was, most likely, the absence of the critical edge between band and cap, which every tablet bears inherently. Pellets with their spherical shape do not offer such crucial areas. Pellets, which passed through a fluid bed coating process experienced hardly any mechanical stress. In addition, to the cushioning effect provided by the processing air, the excellent accessibility of the whole product’s surface area allowed perfect drying. This produces coated substrates, with smooth surfaces (Figure 1), already delivering functionality at moderate coating levels (Figure 4). The mechanical impact on the substrate was higher in both drum coaters leading to the surfaces appearing slightly rougher (Figure 2, Figure 3). Functionality was achieved at similar coating levels in both coaters. Differences were merely found regarding processing time, due to differences in the available inlet air quantities. Expectedly, fluid bed coating allowed the shortest possible processing time thanks to larger quantities of inlet air available. 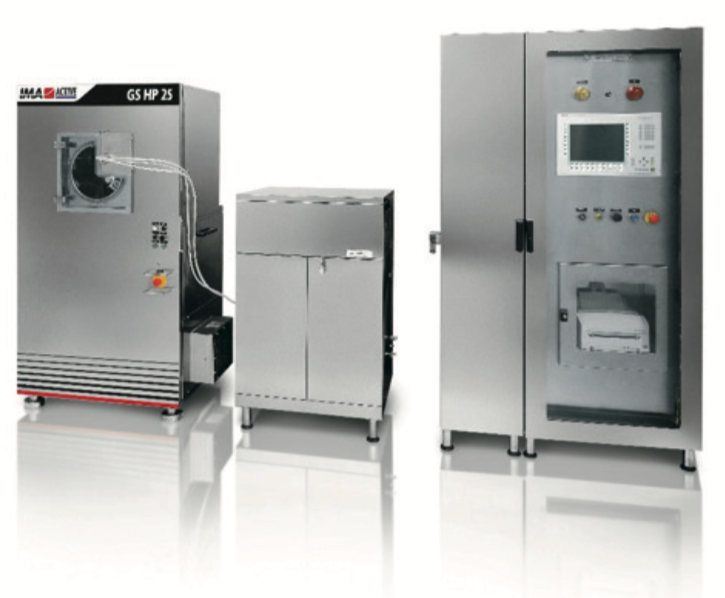 The fluidisation of the particles, inherently provides high drying capacity and mixing efficiency. Consequently, the coating formulations could be applied economically quicker and more homogeneously. In contrast, both pan coaters offer the advantage of being a more compact installation (smaller footprint). Additionally, access to the processing area is faster and easier. Furthermore, large batch sizes can be coated in smaller sized equipment. In the current study, side vented pan coating allowed high inlet air quantities resulting in higher spray rates compared to the solid wall one. The dedicated design of the wedge wire screen drum allows high process air volumes, consequently resulting in high spray rates and economical short process times; similar to conventional perforated drum coaters. Compared to the fluid bed processor, this technology provides two main advantages: firstly, it comes with a much smaller footprint, and secondly, the spray guns are readily accessible during the process. Additionally, drum coating processes can easier be controlled simplifying up-scaling procedures. Solid wall coating generally allows a vast variety of different processes (e.g. tablet coating, powder layering). In order to gain this flexibility, one needs to sacrifice on the amount of inlet air that can be utilised. As a result, processing times were slightly longer but offer the advantage of gaining a higher coating uniformity.